Study for ITIL Certification at Foundation Level by taking an online training course with 4PA ! ITIL Foundation is an important, entry-level qualification for participants who want to become knowledgeable about the core elements of the ITIL Framework. Our course uses interactive technology, high quality media and downloadable resources to teach the key elements, principles and processes of the 5-stage ITIL Service Lifecycle and as such, is fully accredited by PeopleCert, who are licensed by AXELOS as an Examination Institute for the ITIL Foundation Certificate in IT Service Management. With this course, you’ll receive 6 months access as well as FREE exam voucher to use within 6 months of courses access. Just contact us when you are ready to sit the exams! Participants will also be introduced to the service lifecycle, it’s processes, and the functions which carry out those processes. Our course has been accredited by PeopleCert, who are licensed by AXELOS as an Examination Institute for IT Service Management. Why Study ITIL Foundation with 4PA? With eLearning, individuals and organizations avoid the typical costs of travel and consultancy by studying independently online.Our online training courses are designed with mobility and accessibility in mind. You can access your training from any desktop computer, laptop, tablet, or mobile phone. Specifically, you will understand how the ITIL best practice framework can be used to improve the quality, effectiveness and efficiency of service management in every type of organization. ITIL will enable you utilize and implement IT service and capabilities to provide and maximize value within your organization. By adopting the method and service within ITIL will increase productivity, optimize costs and improve customer experience. This eLearning course contains all the learning materials you need in order to prepare for the ITIL Foundation exam. The objectives of this foundation course in service management are to enable participants to understand the importance of service management, both to the IT service provider, and to their customers. Specifically, we show how the ITIL best practice framework can be used to improve the quality, effectiveness and efficiency of service management in every type of organization. The service strategy publication provides guidance on understanding the most important practices that need to be employed to define and carry out a service strategy in a service provider organization. In the service design part of the course, we look at the Purpose, Objectives, Scope and business value of this lifecycle stage. Service Transition consists of 7 different processes. We examine the purpose, objectives, scope and business value of this lifecycle stage, and look in detail at the Change Management process. Once you have passed your foundation exam, you may wish to continue your service management studies. The qualifications do not expire – there is no requirement to renew them as with some schemes. There are 4 levels of ITIL qualification, shown here. Each exam earns you credits, to add to the 2 credits awarded for the foundation certification. You may wish to move up through the levels to Expert or Master, or you may just want to increase your knowledge in a particular area. The scheme is designed to satisfy both approaches. You can take as few or as many Intermediate qualifications as you require, and to suit your needs. The Intermediate modules go into more detail than the Foundation level, and these qualifications are recognized throughout the IT industry. Thinking of sitting the ITIL Foundation Exam? On this page, you will find everything you need to know! When you have completed the learning outcomes of the course, you will be ready to start preparing for the ITIL Foundation exam. To support you with this, the eLearning course contains a practice exam that will simulate the conditions of the real thing. 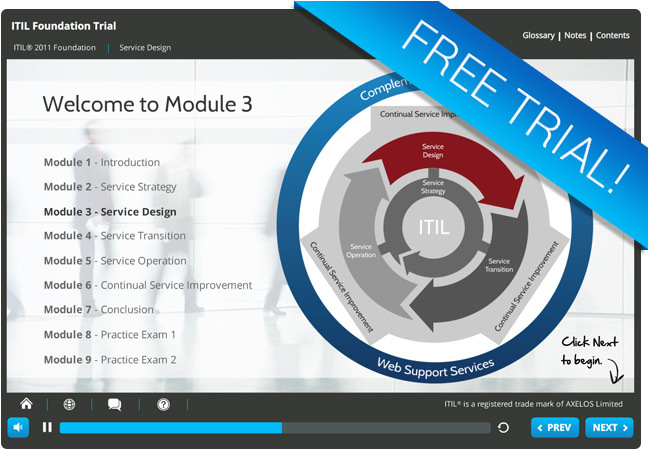 Why not try out a free trial module from our ITIL Foundation eLearning course! In this ITIL Foundation trial module, you will learn the purpose, objectives, and scope of Service Design via a mixture of interactive and audio techniques to enhance the learning experience. Like the full ITIL Foundation eLearning course, you can access this free trial module from any device whether you are at home, at work, or on the move!